Everything was very clean!!! Everything was just perfect!! Pleasant experience! Check-in was quick and easy, they had all info in order when arrived. Check-out was just as smooth. The staff, down to the maintenance people, were very friendly and accommodating. Offered materials and suggestions on local places which made it easier for us to find stores and restaurants to visit and were pleased with all of them. Great Staff and place to visit! The condo was decorated very well and very spacious for a one bedroom! Perfect location for relaxing and view was fabulous. Amenities were more than we needed and the property was extremely well kept. Have recommended to many of our family and friends and do plan to revisit there often! Wonderful property, definitely will be back! Everyone was friendly and even took time to not only answer our questions, but also made some very good recommendations on activities our family would enjoy. We loved the property. So nice to have direct access to the beach and the pier right next door. Our unit was so nice. We did a lot of cooking/baking and it was nice that all our needs were taken into consideration. Our unit had everything we needed. I can't wait to come back!!! our family continues to grow, this time we rented a 3/3 and this unit. who knows next time we may need more room. Your team members were always so helpful, gracious and courteous! Thoroughly enjoyed our stay with you all! Was a very relaxing area and the proximity of the home was perfect! Close enough to enjoy other activities but peaceful, beach scene to enjoy and relax!! Beautiful. It was exactly how it was described in the property description. 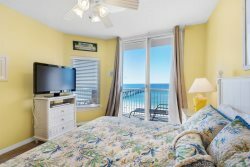 Navarre Properties is my new go to vacation experts! Friendly, courteous staff! Appreciated all the helpfulness given while booking, reserving and staying in the home! Best vacation in a long time! So peaceful and relaxing but still close enough for entertainment such as museums, zoo & shopping! We are planning our next stay. We won't use any other company but navarrelistings.com. Excellent stay that was exactly what we saw on the web site.